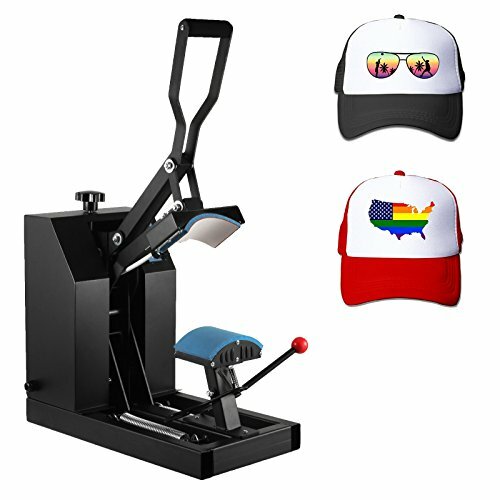 5.After machine reach temp you set, then place cap on the working table flatly, place the photo you printing on cap, then press down the handle. When the machine reach the time you set, it will alarm, you could take out the cap and peel off the paper, then photo will transfer on the cap. Attention: This machine is not suitable for minors to use or food processing. Heating element - Curved element (7" x 3.75") allows superb transfers onto all types of hats and caps (lower platen/pad measures 6" x 3"). Clamshell design - Space saving design allows plenty of working room while keeping your hands a safe distance from the heated element. Full-range pressure-adjustment knob - Easy to access control allows the pressure to be adjusted according to the thickness of the material you're transferring to. Parallel arm handle with ergonomic foam-grip - Minimizes handle flex when opening and closing the machine, unlike some single-arm machines that tend to twist and torque. Aluminum element - Heating element is machined from a solid block of high-grade aluminum.